LOUISA, VA – A Fall Festival featuring some of the nation’s top barbeque chefs, antique cars and trucks, food vendors, and music all day will begin at 10 am at Small Country Campground in Louisa. A state-level competition sponsored by the Kansas City Barbeque Society will determine who is the top pig and chicken cookers to go to this year’s national Jack Daniels BBQ contest in Memphis, Tennessee. For a donation of only $10, you can enjoy the smells and aromas as well as the music and fun at the 2018 Que & Cruz Fall Festival. And for another $5 you can become one of the judges in the People’s Choice pig pickin’ contest, savoring the flavor of the best BBQ in the nation. Plus there will be plenty of pulled pork, hamburgers, chicken and more available on the grounds. Antique cars and trucks will be on display. Vendors will be selling jewelry and clothing, candles and wood carvings, and a variety of homemade art and items. Five Virginia bands have volunteered to play on the new stage at Liberty Park from Noon ‘til 6 pm including Campbell Road, Anderson Highway, Queens Over Kings, RivrTowne, and Wylde Katz. Sound will be coordinated by Your Sound Choice. All donations and money raised will go to the University of Virginia’s children pediatric kidney research program in honor of Lindsay Hall, a two-year-old born with only one partially-functioning kidney, who will be staring at the Festival. No money goes to Lindsay or her parents. 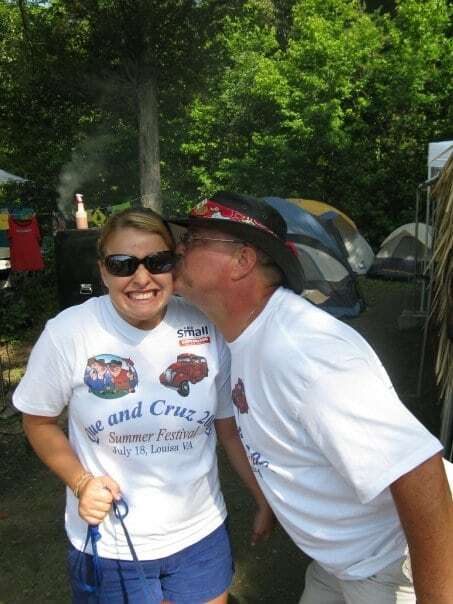 Lindsay is the Great Granddaughter of the campground owner Bill Small. Vendors are still welcome at a cost of $50 for a 10 x 10 foot booth. Sponsors are also welcome.